Portraits Of The Poor: Dignity In Times Of Despair Taxing Visions is a new exhibit that depicts the underside of the Gilded Age at the end of the 19th century. The artwork on display at the Huntington in San Marino, Calif., pays tribute to the men, women and children hit hardest by the economic downturn. In Panic of 1869, Charles Knoll depicts members of a wealthy family who have just lost everything. Oil on canvas, 1869. Taxes, foreclosures, rich-poor discrepancies, recession. Sound familiar? Sure it does. But it also describes an earlier economic period in this country — and the unlikely subject of an exhibition of artwork at the Huntington Library, Art Collections and Botanical Gardens in San Marino, Calif. The exhibit is called Taxing Visions, and in one its late 19th century paintings, Charles Knoll depicts a smart living room — with fine textiles and upholstery, a fancy mantle piece, and a chandelier. "All symbols of what were upper class trappings," explains Jessica Todd Smith, chief curator of American art at the Huntington. 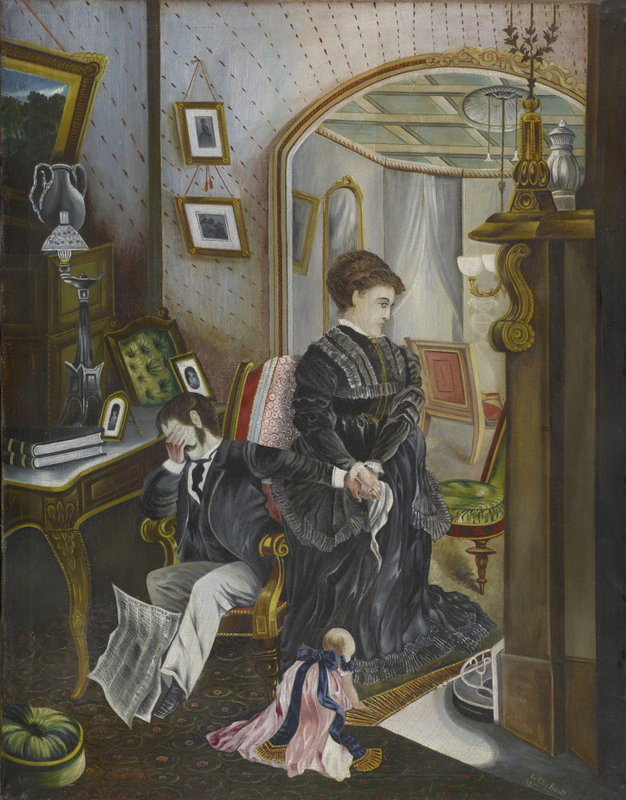 But the painting is titled Panic of 1869, and the people in this well-appointed room look devastated. "The man is sitting in a chair with the paper at his feet announcing the panic," Smith says. "His hand is covering his face. His other arm reaches dramatically for his wife, who's turned in the other direction, looking disconsolate. The baby is crawling on the floor, completely disregarded in the mayhem." The family has lost everything in that economic downturn — one of many that took place in the U.S. in the late 1800s. It was also the age of the mega-rich industrial "Robber Barons" — Rockefellers, Carnegies, Huntingtons. 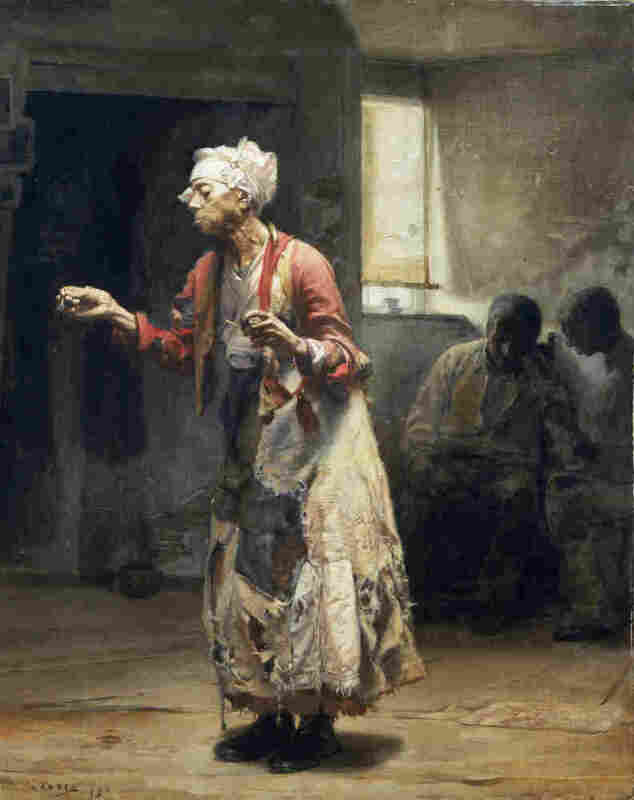 A woman dressed in rags is the subject of Tattered and Torn by Alfred Kappes. Oil on canvas, 1886. "We know that this great wealth developed, but in fact, between 1873 and the turn into the 20th century was a huge depression," says Steven Koblik, president of the Huntington. "The money was not well divided. This great wealth was concentrated in the hands of the few." That may sound familiar today, but what the economy went through back then was much worse — huge cycles of bust and boom, massive migrations from rural to urban areas, and a major influx of immigrants. This exhibit shows what the underside of the Gilded Age looked like. In his 1886 painting, Tattered and Torn, Alfred Kappes depicts an African-American woman wearing a dress patched together from rags — she looks utterly exhausted. And yet, the woman dominates the canvas; she is monumental. Despite her exhaustion, Smith says, the woman has great dignity: "She is concentrating so carefully on lighting this match to light her pipe as though it were the one small pleasure remaining." It is, perhaps, the last tobacco she can afford. The same woman — nameless, now — appears in another work in this Huntington show. The engraving by Gustave Kruell was taken from another Kappes painting called Rent Day. Gustave Kruell created this engraving based on Alfred Kappes' painting, Rent Day. 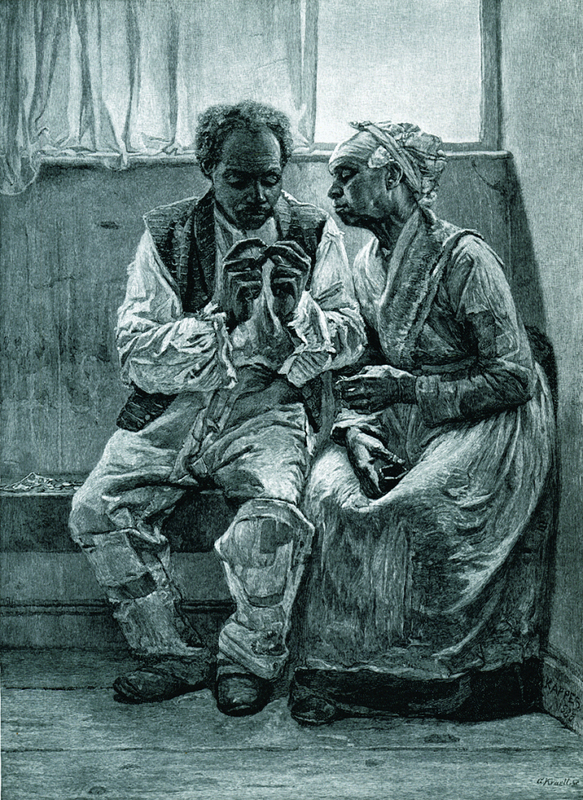 In the engraving, a man and a woman sit side by side, leaning into one another. Their shoes are worn, their clothing is patched, and they are counting their coins with bony fingers. "The title, [Rent Day], says so much," Smith says. "You have stress of whether or not they're going to be able to come up with the amount. That's a theme that's really throughout the show: this sense of the difficulty of ... making ends meet." The artists in this exhibit pay attention to the outsiders of their day: African-Americans, women, artists (there are several paintings of artists locked out of their studios after failing to pay their rent) ... and of course, children. A blind beggar in Julian Alden Weir's 1879 The Flower Seller stands behind a little girl who holds a tray of flowers — the man is sad and resigned, but the little girl is angelic. So too, in the 1886 painting, Buy a Posy. 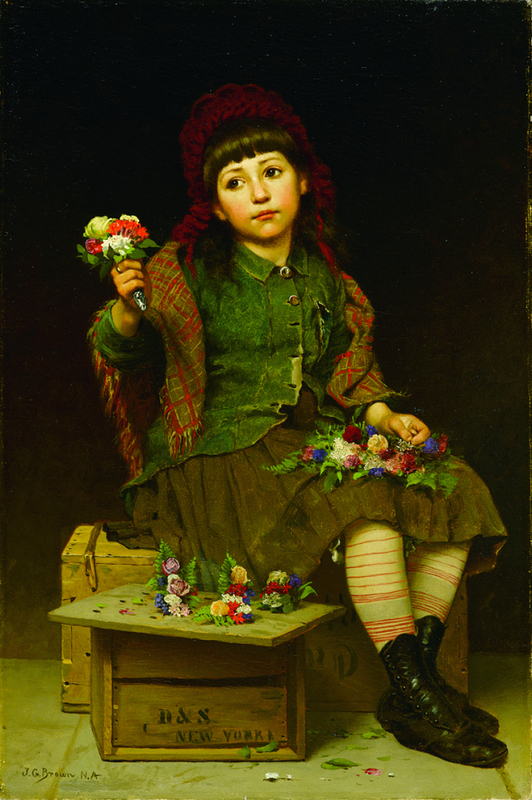 "This painting by John George Brown is of a charming little girl looking wistfully past a small bouquet of flowers to a potential buyer," Smith says. "One of the typical devices Brown used are these wonderful, limpid, large brown eyes that are meant to engender sweetness and sympathy and convey the longing of the child." 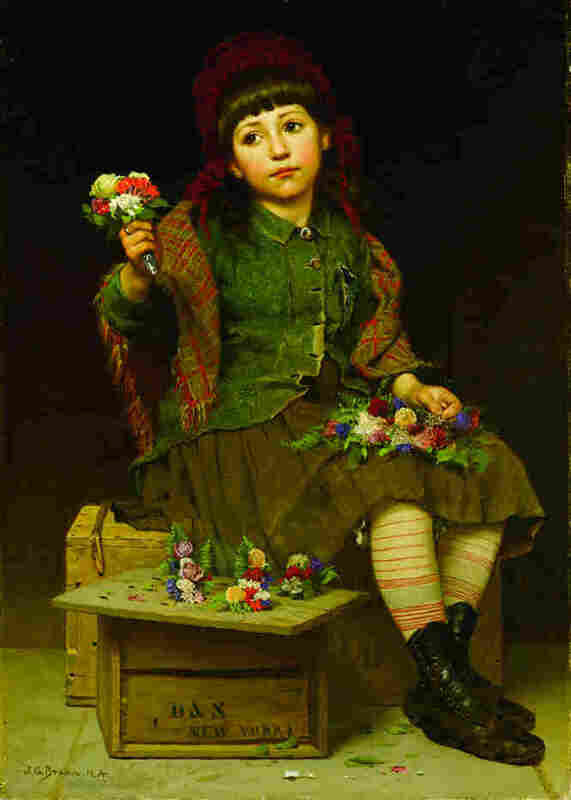 A child with imploring eyes looks out of John George Brown's 1886 work, Buy a Posy. Oil on canvas. She's poor, yet she seems happy — sentimentalized, says curator Kevin Murphy — as are several of these painted children. "One of the artists ... was once asked why he didn't paint [the children] dirty," Murphy says. "You could imagine that these children that were out on the street all day would be pretty dirty. He said that if he painted them with dirty faces, they wouldn't sell." After all, why would anyone wealthy enough to buy paintings during that depression want to have sad, tattered children on their walls? But Murphy says some of the paintings of this period did sell — paintings of street children selling newspapers, matches, or fruit. "Some of these were quite popular at this time because a lot of the very wealthy people were either immigrants or were one generation removed from being immigrants and being poor," Murphy explains. "These images provided a sort of a nostalgia, and also reinforced that everything was possible in America — that you could start off being a flower seller on the street or a match seller, and become Andrew Carnegie." These paintings helped to perpetuate the American dream — that this country was a place of hope, where bright futures might be right around the corner.